The Andy Griffith Show is primarily known for offering up homespun truths and making Americans nostalgic for an idyllic small town lifestyle that is pure myth. It prided itself on offering viewers a half hour of sanctuary from the turbulent social and political upheaval of the 1960s. It’s not surprising, then, that what it’s not known for is trailblazing depictions of women—but going back to the show’s first season in 1960, a glimpse of an alternative, almost feminist vision of Mayberry emerges thanks in large part to Ellie Walker. Ellie Walker, who has the distinction of being Mayberry’s first female pharmacist and Andy’s first love interest, first appears in episode four, “Ellie Comes to Town.” Ellie was portrayed by Elinor Donahue, fresh off of a six-year stint as the precocious teenage daughter Betty “Princess” Anderson on CBS’s Father Knows Best. Donahue was considered important enough at the time to warrant billing alongside Andy Griffith, Don Knotts, and Ron Howard in the show’s opening credits. In fact, she was the only actor outside of the show’s core trio to receive that recognition until 1965, when Francis Bavier was added to the credits after Knotts’s departure. Ellie was meant to be an integral part of the series—so much so that Donahue initially signed a three-year contract—but Donahue appeared in only twelve episodes before asking to be released. Consequently, Ellie got the Chuck Cunningham treatment and disappeared from the show’s landscape without explanation. Before she vanished into the wilds of Mayberry, Ellie was easily the show’s most daring character. She was a woman who had a professional degree (“PH. G.,” Andy muses while looking at her diploma. “Pharmacy Gal?”) in a male-dominated field, an occurrence that would have been unusual in a big city, never mind a small Southern town like Mayberry. Ellie was fresh out of college when she arrived to take over the pharmacy for her ailing uncle, and the townsfolk were both wary of and bemused by the notion of a woman pharmacist. To give the residents of Mayberry credit, it wasn’t Ellie’s gender that bothered them as much as it was her newness. She was a sophisticated, big city interloper who didn’t do things the Mayberry way. Upon discovering that Andy lets himself into the pharmacy when her uncle isn’t around, Ellie immediately establishes new ground rules that don’t involve self-service. She seeks to run the pharmacy completely by the book, even denying Emma, an elderly hypochondriac, the medication she had been receiving without prescription for years. Right from the start, Ellie set a precedent of upsetting the status quo. By the end of “Ellie Comes to Town” she relents and allows Emma to have her medication without a prescription, but she only does it because she discovers Emma’s miracle drug is nothing more than sugar pills. The reasoning behind Ellie’s reluctance to bend the rules isn’t explored as much as it would be now, but as a woman with a job in the medical field in 1960 she would have been held to a higher standard than her male counterparts. Beyond a plot device, her stance in “Ellie Comes to Town” neatly set up her strong integrity, a character trait revisited through the duration of her run. Once she handed over the pills to Emma, Ellie was accepted as a member of the community and her courtship with Andy began in earnest. If The Andy Griffith Show was a modern series, the eventual marriage of Andy and Ellie would have been a forgone conclusion. In many ways they feel like the kind of built-in television couple we’re used to seeing today, replete with mildly belligerent sexual tension. Within the first ten minutes of her first episode, Ellie meets and befriends Opie Taylor who informs her that “he ain’t got no ma,” which reads like an open invitation, making it clear that she was primed to be the future Mrs. Andy Taylor right from the start. 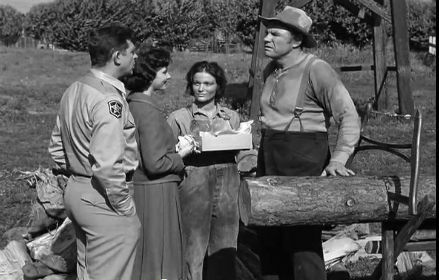 Both Andy Griffith and Elinor Donahue cited a lack of chemistry between their respective characters in later interviews, with Griffith insisting that the fault was mostly his. Indeed there is a sense of manufactured chemistry there, even though they ultimately build a far more dynamic connection than what we see between Andy and his other girlfriends. Some of Griffith’s unease likely came from the decade-long age gap between himself and Donahue, but the major issue was that he didn’t feel confident writing for Ellie. In an extensive career retrospective interview with the Archive of American Television, Donahue revealed that many of her lines were given to Don Knotts because she “wasn’t funny.” At that early stage of the show, no one realized just how special the chemistry between Knotts and Griffith was going to become, but as they did the role of Ellie in the show began to diminish in favor of the buddy dynamic that existed between the sheriff and his bumbling deputy. Even more than writing issues and a perceived lack of chemistry, there was one major flaw in the design of Ellie that likely doomed the character: she was just too challenging for a show that liked its conflicts to be mild at best. She was a constant reminder of the turbulent changing world beyond Mayberry, which contradicted The Andy Griffith Show’s mission statement to provide viewers with an escape from the messy political and social climate of the time. 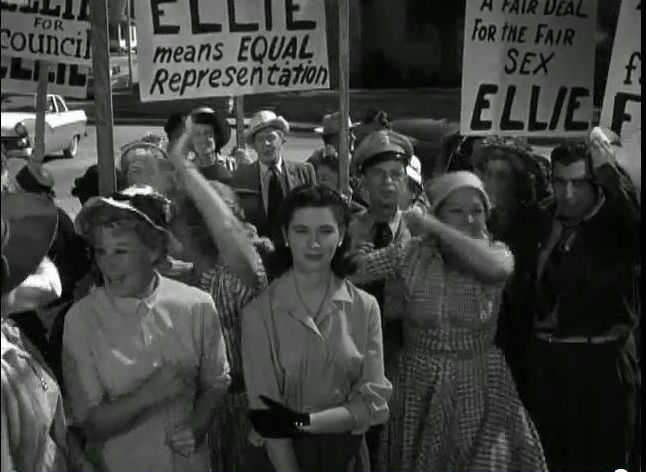 This is seen most clearly in episode ten, “Ellie Runs for Council.” The episode doesn’t shy away from feminist themes—though it loses points for including a disturbing domestic abuse joke accompanied by jovial canned laughter—and it stands as one of television’s earliest attempts to address the burgeoning women’s movement without condescension. Andy: Oh, Ellie, you don’t want to concern yourself with government business. You want to let the men worry about that. All you want to worry your pretty little head about is woman’s stuff. You know, going shopping and looking in windows and trying on hats and eating those little bitty sandwiches they have at parties and gossiping…you see what I mean? Ellie: Oh, I see. A woman should keep her place, stay where she belongs. A woman shouldn’t try to think along the same level as a man because we’re simple-minded fools! His position only strengthens Ellie’s resolve to win, and her campaign ends up sparking a battle of the sexes in Mayberry as the women align with Ellie and the men with Andy. The situation eventually escalates to the point where Ellie decides to concede the race to stop the town from being split in two. It’s at this point that Andy realizes the damage his aggressive anti-women rhetoric has done, particularly when he sees that it has rubbed off on his son. It’s Opie cheering about how they “beat the females” and “kept them in their place” that inspires Andy to stand up for Ellie and admit that he’s ashamed of the way he has behaved. His speech sways the town and Ellie wins the race. Her triumph may have meant more had she won the race without Andy’s assistance, but the fact remains that she won, making her possibly the first female character to hold public office on television. It’s a revelatory moment not just for The Andy Griffith Show, but for television in general. Ellie’s triumph marked the high point for positive female representation on the show. After “Ellie Runs for Council,” traditional gender roles were largely reinforced. This is seen most glaringly in the similar season seven episode “Politics Begin at Home,” where Aunt Bee runs for town councilman, only to realize she doesn’t have the mind for politics. The final significant Ellie episode was “Ellie Saves A Female,” and while it too played up Ellie’s independence and feminist spirit, it lacked the political punch of “Ellie Runs for Council.” In it Ellie encounters Frankie Flint, the only child of a stubborn farmer who refuses to let his daughter have “women things” like makeup and dresses because it might distract her from her log-sawing and animal-tending duties on the farm. Ellie can’t help but involve herself in the issue because she sees a young woman being denied the right to live her own life and that’s an injustice too great for Ellie to let stand. Ellie coerces Andy into escorting her out to the farm to deliver a box full of makeup and lotion to a delighted Frankie. Her attempt to help is thwarted by Farmer Flint, who doesn’t take kindly to Ellie’s interference, but Ellie refuses to back down no matter how many times Andy or Flint tells her it’s not her business. There is something marvelous about the tiny Elinor Donahue facing off with the 6’3”, alarmingly imposing R.G. Armstrong, who played Frankie’s father. Ellie is daring in those scenes, refusing to allow herself to be intimidated. The ultimate resolution to the episode involves Ellie convincing Barney to retrieve Frankie from the farm, so that she can give Frankie a makeover and show Frankie’s father how happy it makes her. Once again though, the show undermines Ellie’s agency by having Andy’s intervention save the day. The farmer doesn’t relent until Andy points out that his daughter could be put to better use as a potential wife to an able farmhand than as a farmhand herself. It’s a fairly backwards note to end on, and it’s wildly out of character that the independent and career-minded Ellie wouldn’t find issue with Andy’s pitch. Ellie appears just one more time after “Ellie Saves A Female.” Then she was simply never heard from again. Donahue asked to be let out of her contract for personal reasons that related to her divorce from her first husband and exhaustion—she had been more or less continuously working since she was a child—and Griffith didn’t argue. Donahue said in her interview with the Archive of American Television that if Griffith had asked her stay, she would have said yes because at the time she “needed to be needed,” but no one challenged her decision. It’s not surprising. In her twelve episodes, Ellie challenged Andy and Mayberry more than any of the opportunistic criminals that would roll into town over the next seven seasons. She provided a source of internal, culturally current conflict that didn’t jive with the show tonally. The Andy Griffith Show was never designed to carry the weight of social commentary and the character of Ellie wasn’t designed to do anything else. If they had taken away her integrity, her outspokenness, and her feminist leanings nothing would have been left—Donahue was right, she wasn’t funny. But she still brought something valuable to the show. After Donahue departed, the themes of feminism occasionally cropped up from time to time (most notably in season two’s “The Perfect Female” where Andy’s date out-shoots him), but The Andy Griffith Show largely settled in for the long haul as a quirky, small-town-set buddy comedy and ode to father/son relationships. It’s fondly remembered for that—and justly so—but that first season and Ellie Walker stand as curiosity pieces of the more complicated Mayberry that might have been. I agree: Ellie really upset the applecart by being too-by-the-book! My husband, who is 10 years younger than I am, by the way, only seems to like watching shows made in the previous century; Hawaii Five-O (the Jack Lord one) Gunsmoke, Cannon and of course, the Andy Griffith show. The only one I will sit down and watch with him is the one based in Mayberry. I’m always surprised to see Eleanor Donahue show up in one of those reruns. I forget that Ellie was Andy’s first girlfriend. Before I go on, I must tell you that I grew up in Burbank, CA, and not only did I wait on little Ronny Howard and his Boy Scout troop when I worked at The House of Pies, but when I was a bit older, I shopped at the same grocery store (Gelson’s) as Andy Griffith. Not that we car-pooled; I just ran into him at the deli case every other Saturday or so. My father hated Andy. Only because Andy always had the right answer when Opie had a dllemma. My Dad only wished he could solve all my problems that wisely. So where was I? Oh, yes, Ellie made a much better girl friend and a female foil than his later sycophantic girlfriend, Helen. The character of Helen only seemed to exist to provide Andy with a female companion, whom he treated well, to offset the way Barney treated his girlfriend Thelma. The show wasn’t really about Andy and Helen, or Barney and Thelma. It was about Andy and Barney. The women were just necessary evils. When Don Knots left, the show was not as good. What a ridiculous statement. It was NOT myth. There were plenty of small towns like that many decades ago.